Extract from William Snelgrave's 'A New Account of Some Parts of Guinea, and the Slave Trade.' Snelgrave was a British sea captain in the 18th century and wrote of his experiences as a slave trader on the coast of Guinea. He saw himself as an humane trader and tried to justify the trade by suggesting that many of the men, women and children were lawbreakers, debtors and prisoners of war and that it was common practice in Africa for these groups to be enslaved and sold. He describes in detail four uprisings on slave ships in passage to the West Indies: three were suppressed by the ships' crews and in the fourth the captain was killed along with 80 of the enslaved men and women. 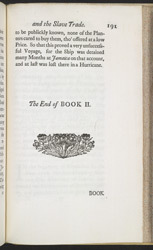 Snelgrave draws attention to the terrible conditions on the ships and attributes the fourth uprising to the fact that the captain did not provide enough food or water.